Swanston Glass & Windows can supply and fit all types of replacement glass for your existing window frames. If your windows are going misty or foggy with condensation building up between the glass panes this means they should be replaced with new glass double glazed sealed units. Apart from looking unsightly the thermal qualities of your windows have been greatly reduced so replaceing your damaged glass sealed units not only looks better but will save on your energy bills too. Please contact us for a price. We can supply and fit replacement double glazed sealed units to your existing Upvc, Aluminium or wooden window & door frames. We can match your existing glass units whether they are decorative leaded glass or Georgian grill, bar units. 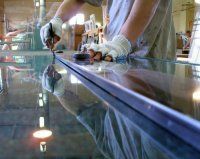 If you require a quotation for any replacement glass & glazing you can phone,fax or email us with approximate sizes and a brief description and we will be happy to provide you with a price. Energy Saving Double Glazed Sealed Units. Did you know that over 25% of the heat in your home can escape through your windows. By installing Pilkington K & Argon gas filled double glazed sealed units to your existing window frames you can significantly reduce your energy bills so please feel free to contact us to see how you could be saving money. If your worried about a vulnerable window, for security or to help stop a burglary, we can supply and fit sealed units made using laminated safety glass with different levels of thickness's. Laminated glass will stay intact for much longer making it difficult to get through quickly. We can also supply and fit toughened safety glass sealed units to British Safety Standards.